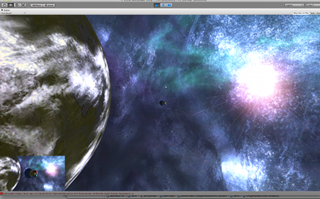 I’m evaluating several different 3d engines for our planned iOS space combat game Torchships. I found good overviews at Never Read Passively, Open Source iPhone game engine comparison, and The Commercial iPhone Game Engine Comparison (3D and 2D). This week I’m digging more into Unity and cocos3d to get a better understanding of the pros and cons. Unity looks very nice but I’m not sure I want to go with a non-iOS-native solution. The same toolset used to make Gears of War and Infinity Blade. Very popular 3d engine that supports a large number of platforms. +Very nice 3d Graphics, physics, and particle effects. Engine to create of richer apps and games on iOS, Android and other platforms. An extension to cocos2d. A sophisticated 3D application development framework for the iOS platform. iSGL3D (iOS Scene Graph Library) is a 3D framework for the iPhone, iPad and iPod touch written in Objective-C, enabling the creativity of developers to flourish in a 3D world without the complexities of OpenGL.